I love that most children know Twinkle twinkle. The song has a tricky tune but I hear so many under 5s trying to sing it; it's wonderful to hear. Although I think the main reason I love this song is it brings back memories of when my two children were little. My husband and I used it as the closing song before they went to sleep. They know once they heard it, story and song time had finished, it was time for sleep. I have hobby horses that the children sometimes wear when we sing this song. They are brilliant! The children and adults always enjoy them. They add to the fun but they’re not essential. On the occasions when they don’t have the prop they still enjoy moving around as we sing. 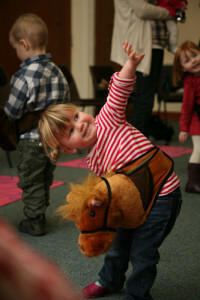 The children love the chorus ‘ay, ay, yippee yippee ay’ especially the yee-haa! To be honest I love singing the chorus too! We always do an action on the yee-haa! (arm crossing the body) and the children delight in this movement. A chance to sing and dance; two of my favourite past times! This is definitely a song that gets the children moving. They love doing the pose at the end: jazz hands! I usually sing this song whilst moving a gorilla puppet; this encourages the children to join in with the singing and movement. The actions are great in this song: wiggling, throwing arms in the air, shaking arms... a time to be silly. The children always smile and laugh during this song. I'm sure you can see a theme running throughout: fun! 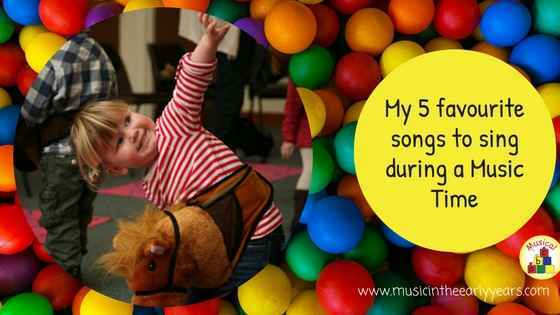 Music activities need to be fun and enjoyable. What's your favourite songs? How do you approach them to get the children involved?